Here, is where you will post your cs for this this RP. Appearance: Obviously, everyone looks the same because you're clones and the armor you carry is predetermined. Although, your clone can have battle scars or a different haircut. Little things like that are good by me. If you have any questions or concerns, do let me know! Bio: Early into his training, CT-9997 excelled academically but underperformed in physical exercises. He would have been destined to be a Medical Officer, but before his batch of clones were moved into advanced training, his closest friend Twitch was nearly killed in a training exercise when he tried to get ahead of a rival by cheating the course. Twitch was struck by moving machinery and suffered major spinal damage. CT-9777 broke from the training course and risked his own life to save his friend. CT-9997 was able to get his friend to safety, but Twitch never fully recovered. Blaming his lack of athleticism for Twitch's injury, CT-9997 dedicated himself to improving his fitness, and managed to pass his physical exams. With his intellect, he distinguished himself as a talented medic and earned the nickname Stitches. After completing his training, he received his first post and was shipped out. Primary Strength: Memorized every bit of bookwork from training. Excellent at regular soldiering, guard duty and sentry posts. Primary Weakness: High strung and irritable. Adverse to combat, will not risk his life in a fight unless absolutely necessary. Appearance: Stitches's kit is maintained to regulation. His armor is maintained to regulation, and only bears unit markings and a medic's emblem. Stitches is slightly shorter than the average clone trooper, and looks perpetually annoyed. Classic Green lightsaber she uses with form ataru. Also a dark grey blue canvas poncho that stops at her waist with a deep hood to conceal her identity and flared sleeves and metal accents. Tattoo included. Bio: Zoe was born on Naboo into a family of senators. Neither of her parents were knowingly force sensitive, but when Zoe was discovered as being so, she was sent to the order. She still has a relationship with them, but it isn’t exactly a peaceful or healthy one, as they had become power hungry political figures hoping for their daughter to return to them a trained jedi and enforce their rule. Zoe however keeps the peace but remains distant to them. She and another Padawan were assigned with their masters and a knight to accompany a troop of soldiers on Alderaan, unaware of how the brutal war would shape her into the fierce warrior she is today. Primary Strength: Zoe doesnt have a certain strength, she doesnt shine in a particular area but more so chooses to excel at all the standard areas such as unarmed combat, lightsaber combat, and the force. However she is naturally swift and acrobatic and mainly uses the force to further enhance that. Primary Weakness: She lacks strength and is a bit ignorant, along with only knowing basic force skills and such. Zoe also becomes very passionate of her goals and channels too much emotion into the simplest of things, and is also very stubborn. Last edited by Pxndora on Sun Jan 21, 2018 1:09 am, edited 5 times in total. Primary Strength: Having received specialized commando training under Jango Fett and surviving through some of the most brutal battles of the Clone Wars, Lock is a hardened and experienced trooper whose loyalty to the Republic is only matched by his ferocity in combat. An efficient commando, he is trained and experienced in conducting front-line reconnaissance, unconventional warfare and specialized operations less suitable for standard clones. Primary Weakness: Like the other Alpha-Class clones, Lock is fiercely independent and inherits Jango Fett's solitary nature. As a result, he much prefers to work alone and oftentimes he is very vocal about it. He rarely gets along well with other Clones and he has a low opinion of the Jedi, despite being trained by Jango Fett to obey their commands. 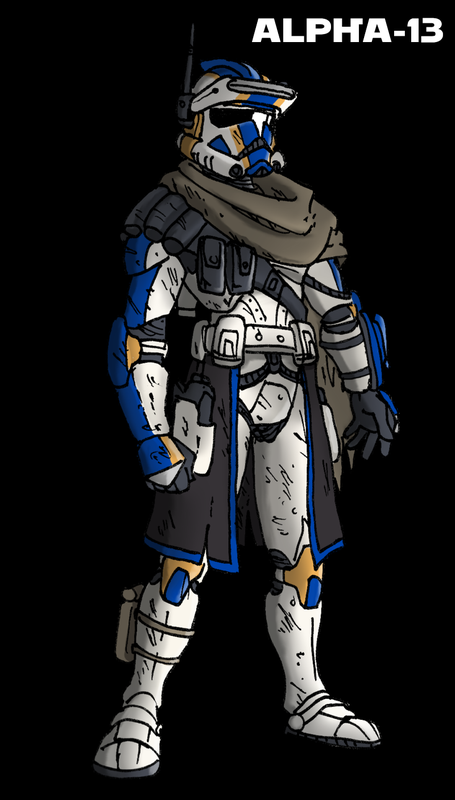 Bio: When the Kaminoans first began building a clone army for the Republic, one of the first batches of Clones that were created were the Alpha-Class, a group of 100 ARC troopers created from the unmodified genome of bounty hunter Jango Fett. In addition to the standard training in which all troopers received a basic lesson on the development of their military abilities, Fett subjected Lock and the other Advanced Reconnaissance Commandos to separate training into ideal special mission groups, capable of operating solely behind enemy lines due to their unique training. Unlike the Clones that followed, Alpha-Class clones were fiercely independent and not modified to blindly follow orders. Because of this, Lock and his Alpha Class brothers were transferred to Stasis and only reactivated two months after the beginning of the Clone Wars in the course of the Battle of Kamino. Baptised by fire through the Battle of Kamino, Lock performed exceptionally during the battle and served the next couple of years under the 101st Legion in battles throughout Republic Space, either alongside the 101st or in small squads during special operations. Quite recently, he's been transferred to the 366th Regiment in their defence of Alderaan.